While grave markers can be creative and downright wacky, most reflect the solemnity of death — just the facts, m’am, perhaps with an accurate but general epitaph, like “Loving wife and mother.” Aren’t they all? And would you really say otherwise if not? Ouch. 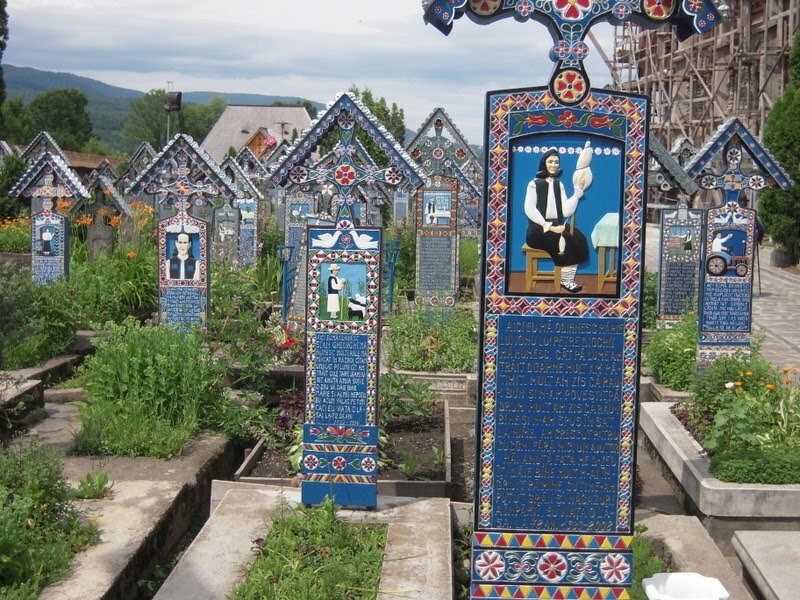 Reflecting local folk art, carved and painted wooden grave markers in the Happy Cemetery memorialize a person’s life and death through often humorous poetry and depictions of community and personal life (i.e., drinking, being a heart-breaker and/or floozy) and the scenes that led to his or her demise (i.e., vehicular homicide, beheading). Check out Dumneazu’s post for a number of photos with accompanying commentary. Great stuff! Posted by Meg Holle in Cemeteries, Death + Art / Architecture and tagged grave markers, memorializing. Bookmark the permalink.